Wondered how much RAM there is inside the new iPad Pros? Obviously, that's not the kind of information you'll get from Apple, because it doesn't discuss tablets and phones like it does computers. However, there are ways to establish the missing pieces in iOS devices' hardware spec sheets. One approach is GeekBench, the popular benchmark test which profiles phones and spills the beans on their hardware makeup. The 10.5-inch and 12.9-inch iPad Pros were taken through GeekBench and came out as 4GB RAM devices. In combination with the A10X processor, the tablets represent probably the most powerful ARM-derived mobile hardware available to consumers today. Of course, there are 6 and even 8GB RAM phones making their way to the market, but none have quite the processing punch as Apple's latest chipset. However, with a $329 iPad being able to satisfy the vast majority of people's needs, the iPad Pro's hardware might alone won't be enough to convince them to pay double that (or more) for a Pro tablet. There's a very real risk the iPad Pros will remain niche devices for creatives and professionals – especially in an economy less than enthusiastic about purchasing tablets. 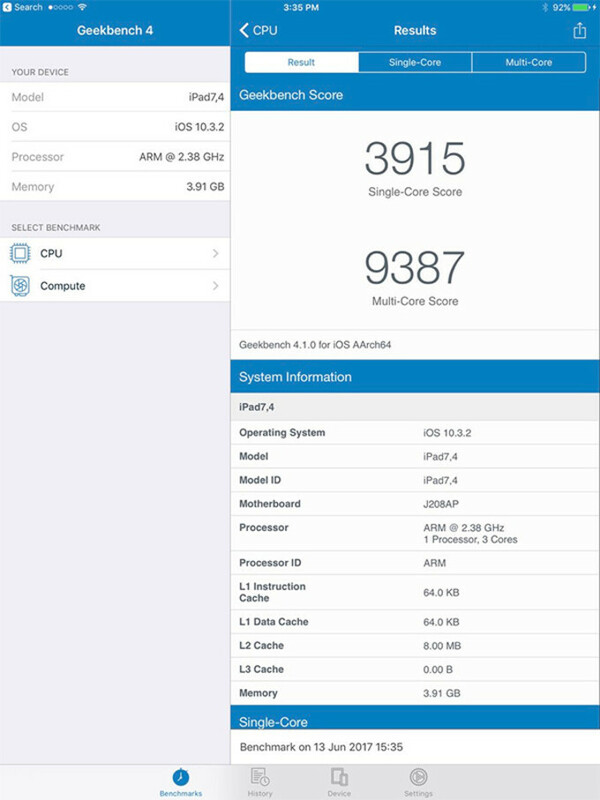 Wow, isn't that almost double the multi-core score of the A9X? Performance wise, this tablet should last you a good 3 years. Hang in there Air 2. I won't trade you. The only variant worth buying is the10.5in 256gb wifi, cost $750 but I think it's worth it(just barley) . The pricing for the other variants and every 12.9in are way of the mark. where are all the iJunk fanboys who keep saying that they don't need more than 1GB RAM for all their overrated junks? Has always needed more TBH, Apple just stubborn as hell. "I bet 99% of the 4gb RAM tablets sales are iPad in 2017,the remaining 1% will be MS tablets" Sounds like every people from the third-world country can afford to buy an iPad Pro, not iPad 2017. Are you sour grapes? Never tried other tablets before? Oh never mind, you still don't know the meaning about "sour grapes". Pathetic lifeless troll. Fanboy like you are the reason why there many Apple haters all over the internet. Windows and macOS are desktop softwares, dumb. They will obviously be no match for a mobile OS like iOS. Do you even learn bro? 4GB RAM? But I thought iOS devices never needed that much RAM in the first place! That was when they were featureless and ran one app at a time. "That was when they were featureless and ran one app at a time." They still run one app at a time... and still featureless (by ANDROID standards). I fail to see your point. "They still run one app at a time" This argument is completely ignorant and just stupid. This hasn't been the case since the iPad Air 2. "and still featureless (by ANDROID standards)" Really? 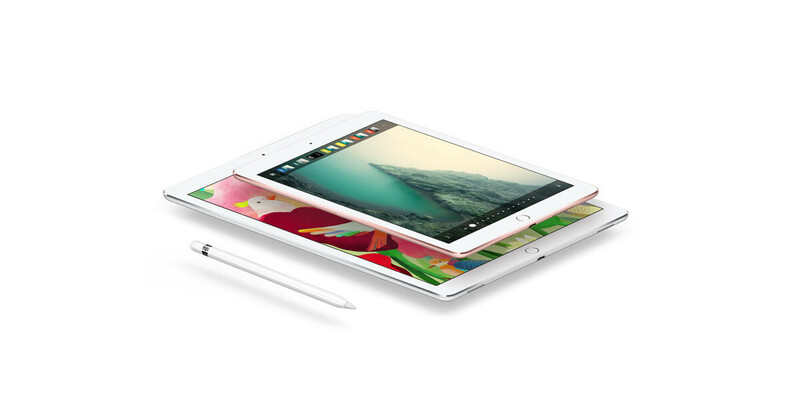 Are you really comparing the iPad Pro to any of the thousands of junk android tablets? All the Android tablets aren't even worth comparing to the cheap 300 dollar iPad model. Gtfo with your ignorant bulls**t.
I was talking about running apps in background, and not just running apps simultaneously via multi window. And I spoke of the Android OS, didn't talk about Android tablets specifically. Besides, Android tablets still do more than any iPad can, productivity-wise. "All the Android tablets aren't even worth comparing to the cheap 300 dollar iPad model" Cheap Android tablets? You are talking about specs there, meanwhile I was clearly talking about the ANDROID OS, you dumbass. Besides, there have been flagship Android tablets too, like the Galaxy Note 10.1 and Note Pro. Now get lost. Point was they actually do split screen apps and other things now that they never did before. I'm not debating Android vs iOS in my comment, simply stating they do more now than they used to. Eventually RAM needs to increase to handle more. You're again revealing your true troll identity, trojan. See post no.29 to know it isn't iOS that needs more than 1GB. But the desires of the people to have more. "See post no.29 to know it isn't iOS that needs more than 1GB. But thedesires of the people to have more" How am I trolling when I simply said what the iFools have been saying since years ago in order to downplay the more RAM being put in Android phones and justify the one they have? Didn't they say they do mot need more than 1 GB RAM, untill the iPhone 6s arrived? People have the desire for more RAM? Then why didn't Apple give 4GB RAM in 2015, because it was clear that people desired more RAM back then too. Now get a life. Calling iFans as iFools is itself an attempt to troll. There's nothing more left to say.